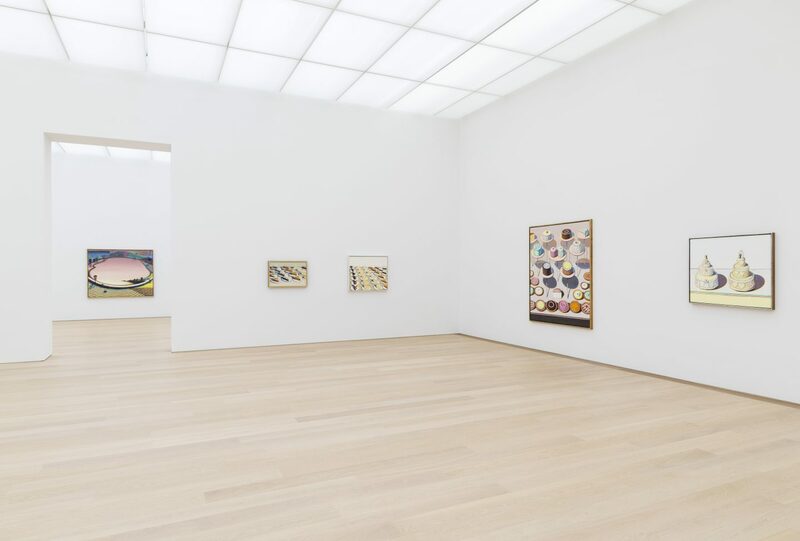 Museum Voorlinden proudly presents the first-ever European retrospective of the work of American painter Wayne Thiebaud (1920), on show from 9 June through 28 October 2018. Famous for his mouthwatering depictions of cakes, ice creams and hot dogs, Thiebaud has placed the American everyday life at the core of his artistic practice. The career of the influential master spans an impressive seventy years and counting. Now aged 97, he has still not put down the brush. 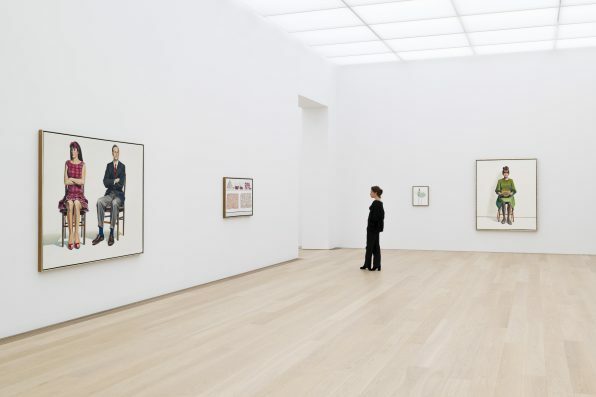 Voorlinden brings together around sixty of his works from 1961 to 2018. Thiebaud’s paintings of cakes, people and landscapes are created with the utmost care, with subjects often set in isolation on the canvas in clear compositions, glistening colours and a thick impasto. His cakes are especially well-known. Their layers of pasty, glazy paint nearly make their deliciousness palpable, giving rise to the delirious urge to simply lick the frosting off the canvas. 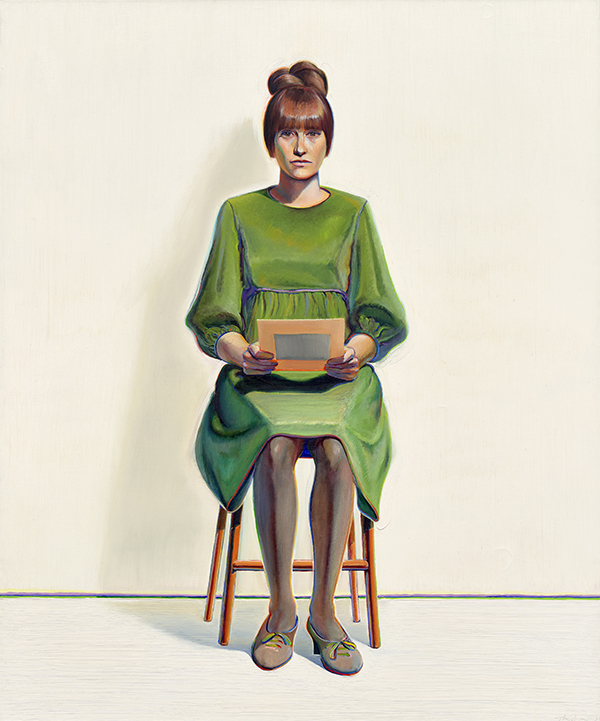 Thiebaud calls this technique ‘object transference’: essentially bringing an object onto the surface, almost creating sculptures out of paint. His colour schemes are remarkable too. Pastel shades and bright colours go hand in hand and shadows aren’t merely dark shapes, but rainbows, nearly aureolas of colour. In the shadow all the light happens, says Thiebaud. Because of his many depictions of everyday objects, Thiebaud is sometimes associated with the pop art movement, which emerged during the early years of his career. But today, at the end of his career, it seems that such a label falls short in characterising the painter’s distinctive style. Whereas members of this movement draw inspiration from mass media, Thiebaud paints on the basis of his own memories, and his loose brush strokes are miles away from the mechanical, hard-edge reproductions by artists like Andy Warhol. Thiebaud, rather, is a born painter who stands on the shoulders of modern masters like Edward Hopper and Paul Cézanne. He also says he has always harboured an admiration for classical painters such as Johannes Vermeer and Diego Vélazquez. Director Suzanne Swarts: Thiebaud’s cakes seem to jump off the canvas, as if you can just reach out and eat one. This is painting at its most delicious. 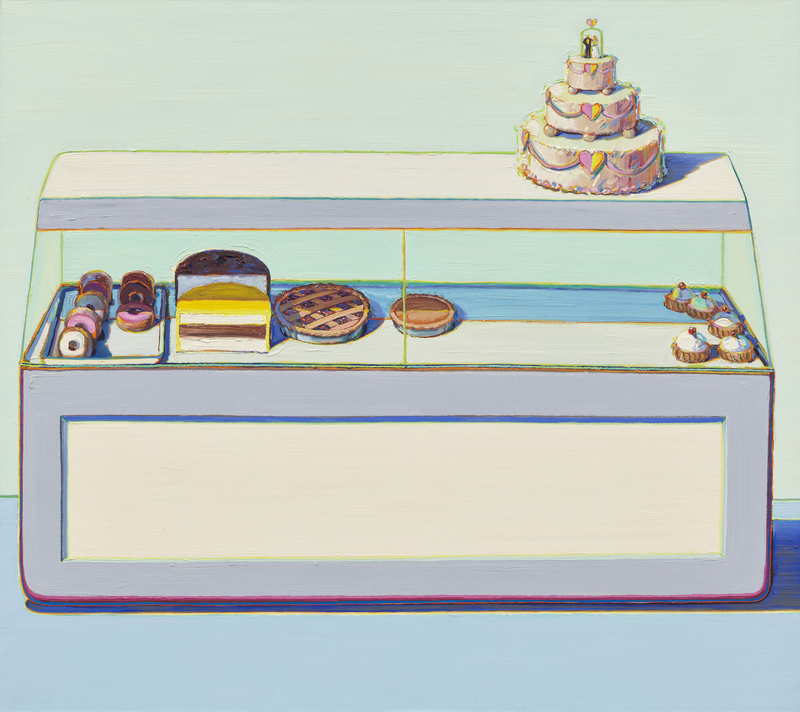 Thiebaud’s well-known still lifes of cakes and hot dogs are put into dialogue with his portraits and landscapes. His depictions of people – he prefers to call them figures rather than portraits – exist, like his still lifes, in an isolated open space, emphasising the painterly impressions of the objects. 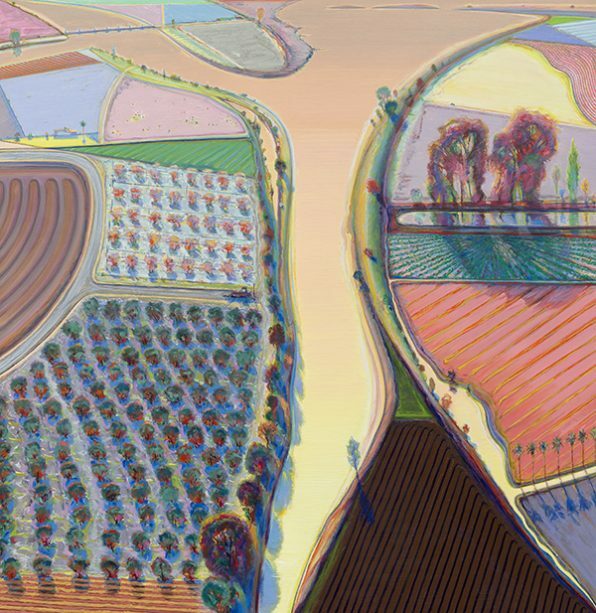 Thiebaud’s landscapes reflect the sentiments of his earlier works in their alluring way of using and combining colours and their distinct sense of composition. Rivers and mountains abruptly cross or cut off the frame through the use of daring viewpoints with a dizzying effect. As such, the fruits of Thiebaud’s rich career continue to surprise the onlooker with new insights and perspectives. This first European exhibition will be an homage to an artist who dedicated his entire life to painting. ‘Wayne Thiebaud’ is the final part of American Season, a series of three exhibitions bringing together different sides of American art history. The series started in the autumn of 2017 with a presentation of the emerging talents Shio Kusaka (1972) and Jonas Wood (1977), followed by a solo exhibition of the renowned sculptor Martin Puryear (1941). The current show will be accompanied by a catalogue comprised of in situ photographs of Thiebaud’s works. Voorlinden is the first European museum to organise an exhibition around the artist and is the only Dutch museum to own some of his paintings. In this way, the museum continues its effort to shine light on artists who have a strong tie to the collection. Wayne Thiebaud was born in 1920 in Mesa, Arizona. He lives and works in Sacramento, California. He once was an intern at the animation department of Walt Disney Studios before working as a commercial cartoonist and illustrator from 1939 to 1949. After this, in the early ‘50s, he studied Fine Art at San Jose State College and California State College in Sacramento, and from then on, he dedicated his time to his own work alone, forgoing commercial assignments. During his career he has always been active in teaching; from 1951 to 1960 he taught Fine Art at Sacramento Junior College and from 1960 to 1976 at the University of California. In 1967, he represented the United States at the São Paulo Art Biennial in Brazil and in 1985, the San Francisco Museum of Modern Art organised a comprehensive retrospective of his work. In 1994, Thiebaud received the National Medal of Arts, the highest honour for an artist awarded by the American government.